Art Talk: Happy Birthday to me! Okay, that sounds self-serving and cheesy wishing myself a Happy Birthday but as I get older, I guess there is less importance put upon one's birthday celebration. I'm 35 today! No longer the young thing I used to be. My body is no where near what it used to be (Thank you my children!) and I have gray hairs that need coloring. I am now at an age that if I was to be pregnant (which I'm NOT!) or have surgery, I would need pre-screening or special tests done... I'm closer to middle aged and farther from my teen years. However, I am blessed in many ways! I have 2 young and wonderful children! I've been married for 9 years and have a hubby that is in most ways my opposite and compliment. I have an accomplished career and a hobby that is on it's way to being a second career! I am lucky in so many ways! Today is full of fun things. 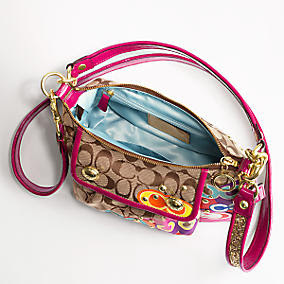 I ordered my new Coach bag! Here is what it looks like. I had to call around to get it. Apparently it is out of stock due to popularity, but I got one from E. Hampton! YES! They are mailing it to me and I should get it by the weekend! Soooooo excited! Matt also got me a cake last night from Carvel's to celebrate. I'm afraid to get weighed in this week at Weight Watchers! I am trying to be good really I am! Anyways, we are going to go see Dave Matthew's tonight as another birthday treat! We have seen him twice before kids. This is a treat having him playing right in Syracuse and I hope it will be a good night for a concert! Right now it is gorgeous out but they are calling for some possible rain and thunderstorms tonight... hope not! So, this is the third event out with just hubby and I in 2 weeks! This NEVER happens! I feel so lucky! It's a happy day after all! Hope your day is as blessed as mine! Dave Matthews, Cake, & a Coach purse! I don't need to wish you a happy birthday...you already are having one. Yes, from the side of the hill I'm looking at you are very wise to appreciate each and every birthday, it beats the alternative of not having a birthday. Love those babies, treasure every moment and continue to make time to nurture your marriage. When the kids are grown and gone it will just be the two of you...and believe it or not the empty nest is an awesome place to live if you enjoy the person you're sharing it with. HAPPY BIRTHDAY JEN!!!!!!!!!!!!! HAVE A GREAT TIME AT THE CONCERT!!!!!!!!!!!! Happy Birthday Jen!!!! you have a great night out!!!!!!!!!! I'm jealous of your bag! 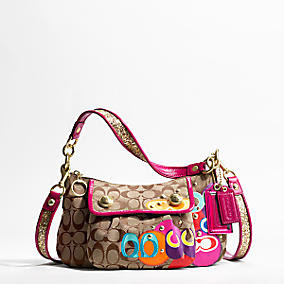 I love Coach! Someday I hope to own one too.